Three years on from exclusively signing to Hospital Records and Exeter duo Fred Vahrman and Josh Jackson have taken the drum & bass lands by storm, sweeping through with their melodic and euphoric waves in a whirlwind of musicality and dance-floor destruction. It was Pendulum's controversial and genre-changing album 'Hold Your Colour' and High Contrast's sophomore 'High Society' that converted the pair to Drum & Bass although both initially into live music. As two keen musicians with Fred on guitar, piano and vocals and Josh on guitar and drums, unique instrumentation has become somewhat of a trademark sound on their production. Influenced by a wide-spanning range of sounds outside of the realms of drum & bass, from rock, funk, soul & jazz; Fred V & Grafix cite artists such as Coldplay, Arcade Fire, Bombay Bicycle Club, Biffy Clyro, Alt-J, Ben Howard, The 1975 and The Naked & Famous as key inspirations, alongside fellow Hospital D&B artists, High Contrast and Logistics. After several releases on Talkin Beatz, Allsorts & Viper Recordings, Fred V & Grafix were a clear-cut choice for worldwide drum & bass imprint Hospital Records, making their first appearance with the label as part of the 'Fifteen Years Of Hospital Records' compilation with 'Find My Way'. Since then they've made their way through to the top of the ranks with a succession of standout releases. It was their summer smasher 'Major Happy' that really made their mark drawing support from across the globe, a festival favourite and regularly taking over the BBC Radio 1 airwaves counting Annie Mac and Zane Lowe as fans. Their solo Hospital debut came in the form of four-track EP 'Goggles' delivered in March 2013. An eclectic blend of sounds from the sweet melancholy of 'Games People Play' to the synth heavy monster that is 'Basilisk', showcasing the dynamic duo's diverse skill-set in the studio. Following was the release of single 'Here With You' and along with B-side 'Minor Happy' Fred V & Grafix caught the attention of liquid lovers world over. March 2014 saw the long-awaited release of their debut album 'Recognise', combining their love for live music, weighty sub bass and creative collaborations with new-school vocalists and producers. With prodigious songwriting, epic musicality and dancefloor sensibility, 'Recognise' eschews the predictable structure of today's identikit D&B. Simultaneously intellectual and effortless, a breath of fresh air that builds on the success of Fred V & Grafix' previous releases and includes 'Major Happy' and 'We Are 18' favourite 'Catch My Breath'. The second single from the album 'Forest Fires' featuring vocals from Med Schools very own Etherwood and was added to the BBC Radio 1 playlist ahead of its release cementing their crossover success. During the summer of 2014 Hospital Records took part in not one but two epic sound clashes with Fred V & Grafix at the forefront. Together they stole the show taking on esteemed Drum & Bass imprints Shogun Audio, Viper and Ram Records at the Radio 1 Soundclash. Followed up by V Festival's 'Rudimental vs Hospital All-stars' takeover with of course Hospital bringing home the trophy. As well as producers in their own right, Fred V & Grafix have stunned us with their remixing skills shaking up Emeli Sande's 'Daddy' and Rudimental's chart-topping no. 1 hit 'Feel The Love'. They've recently impressed with their spin on SecondCity's 'What Can I Do', Bipolar Sunshine's 'Daydreamer' and Kele's 'Closer'. After spending two years buried in the studio their incredible second album has been released to the world. 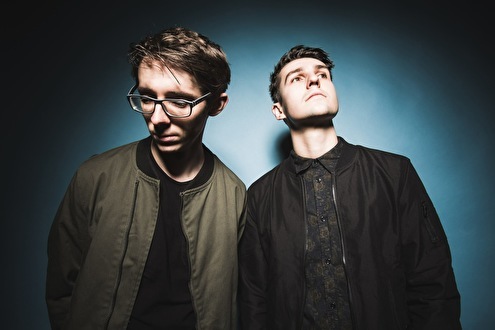 'Oxygen' is a testament to them both, merging their love for indie-electronica and drum & bass, experimenting with different instrumentation and shows the strength in their songwriting talent. The album features vocal performances from new topline finding Amy J Pryce, up and comer Franko Fraize, Bloc Party frontman Kele and Fred V himself. Support has been streaming in from the likes of BBC Radio 1's Friction, MistaJam and Annie Nightingale. Not to mention an invite to join Pete Tong's prestigious Essential Mix series!